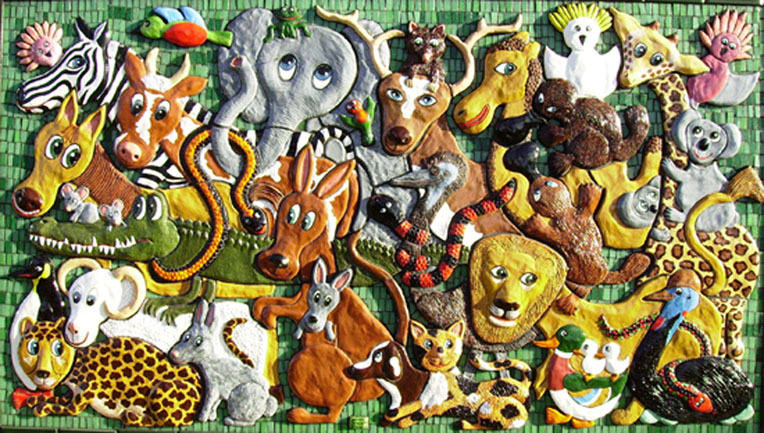 I had so much fun designing and creating this work, all the animals are hand made out of clay, set to dry over several weeks on boards on the floor of my studio and then fired bisque. Followed by, in some cases up to five coats of paint, two coats of glazing and of course drying in between and then fired again in a kiln up to 1000 degrees. The artwork is much like a giant jigsaw puzzle, glued on a waterproof sheet and then mosaic around. My ceramic work hang equally well inside or outside as everything is waterproof and the glue is the same as they use in swimming pool tiling. I am particularly fond of this art piece and love to imagine all the different species of animals all being friends, no one is being anybody’s lunch. All in perfect harmony, everybody is happy, just like I would like the world to always be. 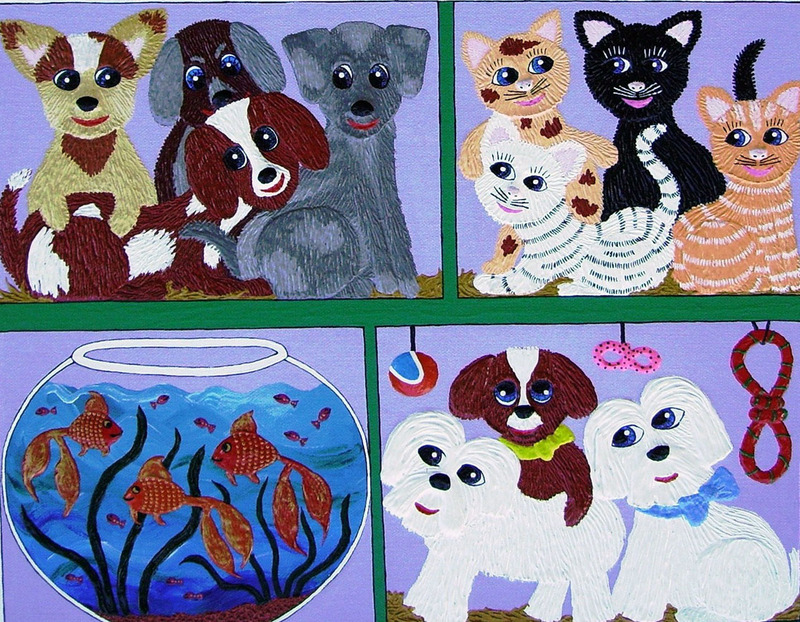 This artwork which recently sold, “All Creatures Great and Small”, celebrates the wonderful animal kingdom of our planet. As does a lot of my artworks both in sculpture & painting. So another passion is of course animals, how anyone could live without animals is beyond me. Particularly dogs, man’s best friend (and womans.lol) right now we have two dogs Vegas named after Las Vegas of course, where we renewed our wedding vows a few years ago and Cheech named after the comedy duo Cheech and Chong. And really those names so suit them ,Vegas a Chihuahua and very lady like and likes the finer things in life and Cheech is like and adolescent with ADHD and a learning disorder, lol. He is all over the place all at once and drives us all crazy even Vegas, but hey, is extremely cute and very lovable. They told us at the pet shop that he was a cross between a Chihuahua and a Mini foxy, but I am sure another “ring in” got in on the act. I will tell you about all our other animals another day. Hope to see you again in the meantime Happy painting and sculpting everyone!